Sheffield Steelers' Robert Dowd. Picture: Dean Woolley. WHILE the main prize of the Elite League title has once again proved elusive to Sheffield Steelers, all is certainly not lost. Last season, the Steelers were unable to make it three regular season championships in a row when losing out to Cardiff Devils, who also beat them in the Challenge Cup Final. But Paul Thompson was able to rally his squad for one last big push come the post-season, culminating in a memorable play-off final victory in double overtime against their Welsh rivals. Once again, Cardiff are primed to lift the league title – possibly in Sheffield tomorrow night – but the Steelers are hoping history also repeats itself 12 months on come the post-season. 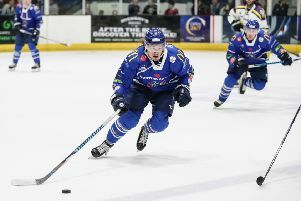 British forward Rob Dowd, who returned in last weekend’s 5-2 defeat at Braehead Clan after a near two-month lay-off through injury, is determined the South Yorkshire club experience that winning feeling once again at Nottingham’s National Ice Centre. “The thing we just have to concentrate on now is building momentum,” said Dowd. “ Even if results don’t go our way, it’s all about making sure we put in good performances. If we do that, the results should come. Put a good string of performances and results in and it will put some doubts in the minds of the other teams and let them know that we are coming. “We need some big performances going into the play-offs. Put a good string of performances and results in and it will put some doubts in the minds of the other teams and let them know that we are coming. Despite his long time out of the line-up, 29-year-old Dowd remains one of the Steelers most significant points scorers this season, amassing 41 points, including 18 goals, in 42 games. His return to action, while on a losing note, brought an end to a intensely frustrating period for the GB international. “Watching the team you are supposed to be a part of is the worse thing – just ask any sportsmen,” added Dowd. Should any greater incentive be needed this weekend for Dowd and his team-mates, a trip to Nottingham Panthers awaits tonight before champions-elect Cardiff come calling tomorrow.